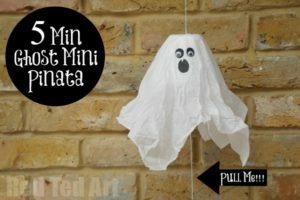 If you are looking for something fun to do with the kids for Halloween then be sure to check out these Halloween crafts for kids to make, which are sure to get them excited about the upcoming holiday. These Halloween crafts are great for decorating your home or to give as party favors and are sure to provide lots of fun for kids. From pumpkins to scary ghosts, there are so many creative Halloween craft ideas that you can do with your kids. Most of these projects will require a little help from you, which makes these Halloween craft ideas a fun family project! 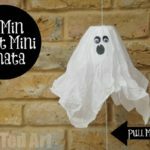 These little ghost pinatas are so adorable. You can hang them up at your child’s Halloween party and let them pull the string to release the candy. Or, simply allow the kids to take them home as a cute Halloween party favor. 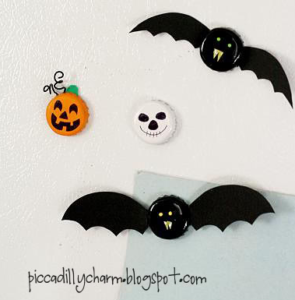 These Halloween magnets are made out of bottle caps and are so cute you will be tempted to make them for other holidays as well. From pumpkins to bats, this is a great project to do with the kids. This would also be a fun party project for kids as well. There are plenty of alternatives to carving pumpkins, and Halloween “mummykins” can be enjoyed all month long. Here is a quick video that shows just how easy they are to create. These little bat party favors are so cute, and can be filled with all sorts of treats. 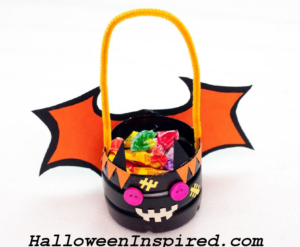 They make the perfect little party favor or even a cute Halloween candy dish. You can also get creative and make other scary Halloween creatures besides bats. 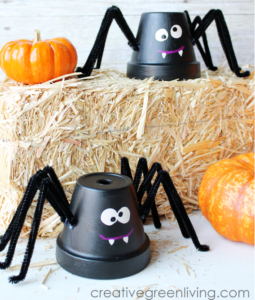 These spiders are a fun craft for kids to make. They are inexpensive to make as well since you can find the small terracotta pots for around $1 each at craft stores. Additional supplies needed include folk art paint, hot glue and pipe cleaners. This is another one of those fun Halloween inspired projects that are only limited to your imagination! October is such a fun month for both kids and adults. And these simple Halloween kids crafts are sure to provide plenty of fun for the whole family. This entry was posted in Crafts and tagged easy Halloween kids crafts, Halloween craft ideas, Halloween crafts, Halloween crafts for kids to make, Halloween kids crafts, Halloween party favors on August 15, 2016 by Halloween Inspired.